You must have seen someone throwing a ball vertically upwards or probably you have thrown it yourself. Yes, the ball goes up for a while and then stops and starts to come down and touches the ground with a bang if you can’t catch it. Let’s discuss the phases of this traversal and motion with some formula and examples. Certainly this motion is due to the earth’s gravity on the ball.Here we will discuss about the acceleration of the ball thrown vertically upwards – both during its upward and downward motion. This acceleration is obviously the acceleration due to gravity caused by the earth’s gravity. Here we are not considering the air resistance. Anyways, in our discussion we will also consider the maximum height reached and the time taken for upward and downward movements. So let’s start. 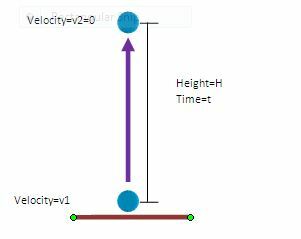 You throw the ball vertically upwards with some velocity say v1, which we will consider as the initial velocity for the upward path. After certain time period say t, the ball reaches a height beyond which it can’t move upwards anymore and stops there i.e. its velocity becomes zero at that height. 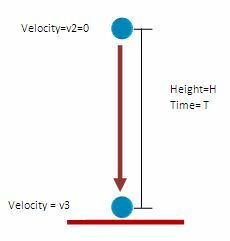 The height where the velocity becomes zero which is the maximum height the ball went upward, say is H. And for this upward movement, the final velocity v2 is 0 because the ball has stopped at the end of this upward traversal. Why an object thrown upwards comes down after reaching a point? When an object is thrown with certain initial velocity (say V), it gains a Kinetic energy at that moment of throwing. As it moves upwards from its initial position (where from it’s thrown) and gains height, its potential energy rises. This happens because Potential Energy (PE) is directly proportional to the height of the object. (PE = mgh where h is the height). Now from the Law of conversation of energy, we can say this rise in PE is happening at the cost of some form of energy being transformed. Here it’s kinetic energy of the object which is expressed as 0.5 m V^2. As height rises, velocity falls which results in reduction of KE and corresponding rise in PE. At one point KE becomes zero. At that point velocity becomes zero. This is called the highest point for an upward vertical movement. 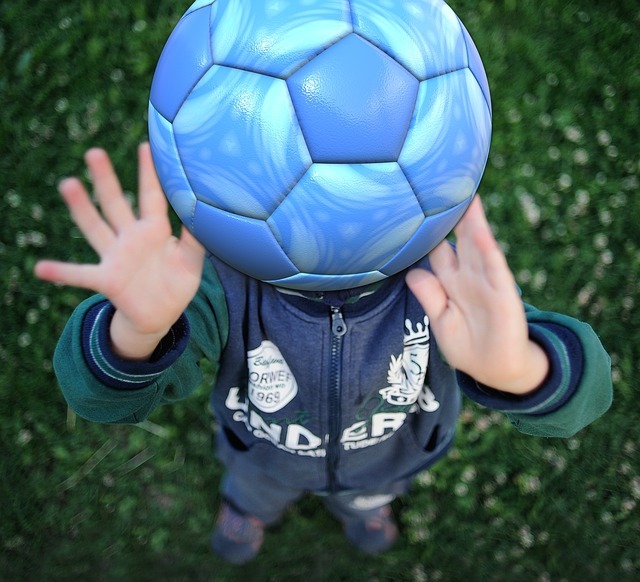 After this the ball starts falling downwards. Differently we can say that the KE availed by the thrown object gets corroded under the negative influence of oppositely directing gravity (Gravitational force due to earth). The influence is negative because gravity is pulling downwards while the ball is trying to move upwards. After some time when the entire KE gets nullified, the ball stops. And then starts falling towards the earth’s surface. In all the above discussions, we have considered Air Resistance as negligible. Considering the Air resistance or Drag force negligible, the only force acting on the ball is Gravity i.e. the Gravitational Pull of the earth towards the the centre of the it. It’s pretty evident that after the upward throw, the velocity of the ball gradually decreases i.e. a negative acceleration was working on the ball. The acceleration is negative because this acceleration is directing downwards while the ball is moving upward and because of this negative acceleration the velocity of the ball is gradually decreasing. And Yes. this acceleration is nothing but the acceleration due to gravity caused by gravitational pull or force exerted by the earth on the ball. It’s value is generally taken as 9.8 m/s^2. See here how acceleration due to gravity varies with height and depth wrt the surface of the earth. As this acceleration due to gravity (g) is working opposite to the upward velocity we have to use a negative sign in the formula below, used for the upward movement of the ball. We know the value of g in SI is 9.8 m/second square. So just for example, if a ball is thrown vertically upwards with 98 m/s velocity, then to reach the maximum height it will take = 98/9.8 =10 seconds. Therefore if a ball is thrown vertically upwards with 98 m/s velocity, the maximum height reached by it would be = (98 x98 )/(2 x 9.8) meter = 490 meter. What are the velocity and acceleration of the ball when it reaches the highest point? Just summing up the answer here though we have already gone through this in the section above. The velocity at the highest point is zero as the ball momentarily halts there before starting its downward movement. During this downward displacement, the initial velocity is equal to the final velocity of the upward movement i.e. v2. And we know that v2=0. And during the downward movement the final velocity is v3. This velocity is attained by the vertically falling ball just before touching the ground. We have to find out the expression of this v3. Also we have to find out the time taken (say T) for this downward fall. So we can say that during the downward fall the magnitude of the velocity of the ball just before touching the ground would be same as the magnitude of the velocity with which it was thrown upwards (v1 here). 1) The maximum height reached by it would be = v12/2g= (98 x98 )/(2 x 9.8) meter = 490 meter. 5) Total time taken for upward and downward movement = 10 sec + 10 sec = 20 sec. Hope you have enjoyed this post. Now you may share it as much as possible using the social media buttons on the page. 2) Gravitation: A stone falls towards the earth but the opposite….